Today I am sharing with you the first of a series of posts that I will be doing on my blog from now until Christmas. I don't know about you, but I need to make a dent in my Christmas card list! I am shocking at making Christmas cards and every year I vow that I will get better at it. SO...this year I am giving myself a challenge + I want to provide you with a tonne of inspiration. So from now until Christmas, every Monday and Wednesday you will get a Christmas card post! I hope that you will enjoy this new series of posts as much as I will enjoy making them. I have decided to start off the series making a card using the gorgeous hostess set that I purchased on one of my recent orders. It is called COZY CRITTERS and matches so perfectly with our FOX BUILDER PUNCH. You can see all the supplies at the end of the post and if you click on them it will take you directly to my store. This set can only be purchased as a hostess set, which means when you either host a workshop with over $250 in sales or place a personal order with those sales you can grab this set with your hostess dollars for just $17.00! I have CASE'd this card straight out of the holiday catalogue. Please don't feel like you have to reinvent the wheel every time you go to make a card. Find one you like and either recreate it or change it up. That is totally ok! As you can see this gorgeous card is a shaker card. Doesn't the dazzling diamonds in that window shaker look great as snow? You could mix it up and create all kinds of coloured snow if you wish. Or add some sequins or little beads or pearls. The options are endless! I have used the textured impressions Softly Falling embossing folder. I love the effect of snow and it pairs really well with my window. I have used one of the stampin' sponges with a bit of Sahara Sand ink on the edge (it's important to have a light touch here) to really accent the edges of the card which to me helps give it a finished look. Usually I am tempted to add sewing to everything, so I was really glad to try a different technique. 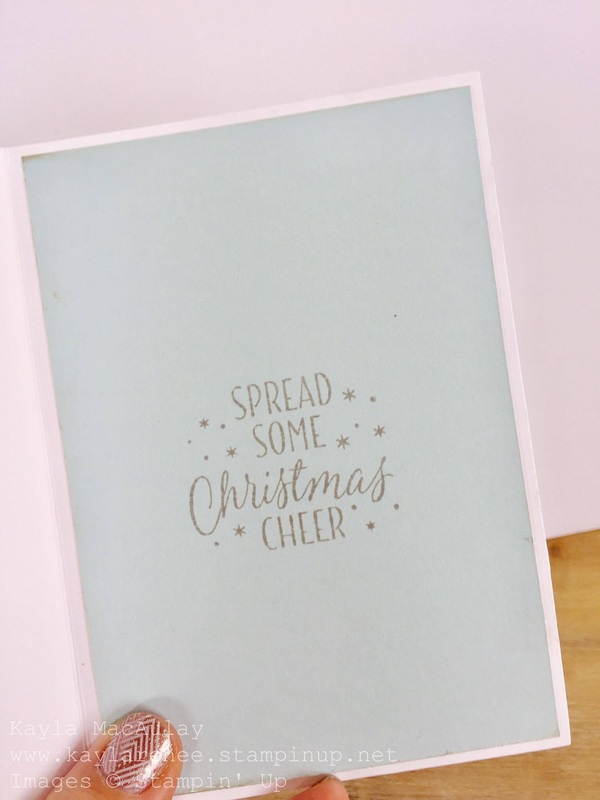 Since the Cozy Critters set doesn't have any greetings/sentiments with it I pulled out my trusty Tin of Tags set and used this gorgeous 'Spread some Christmas Cheer' phrase and stamped it in Smoky Slate. I love how it looks on the Soft Sky card stock and once again I have sponged the edges. I have used Holly Jolly greetings to stamp the sentiment on the front of the card. This is a really good basic set for adding a whole variety of sentiments to your Christmas cards and works well as a builder set to build a whole variety of sentiments. I hope you enjoyed this first post and I look forward to sharing again with you on Wednesday!